It has been a while since I baked and assembled a nice-looking cake from scratch. It was my mom’s birthday last Friday, birthdays = cakes. I originally thought of just making some kind of dessert but a cake is just much more celebratory. I wanted to make a fresh mango cake but mangoes were not in season (too bad). Strawberry it is. I didn’t really follow a specific recipe for the whole cake except for the basic sponge cake. I used a Génoise cake recipe, the ingredients are very simple but it is not the simplest cake to make. It is basically just eggs, sugar, flour, butter and a little vanilla extract. The layers consist of whipped cream, my own homemade strawberry jam, fresh strawberries, and a honey syrup. 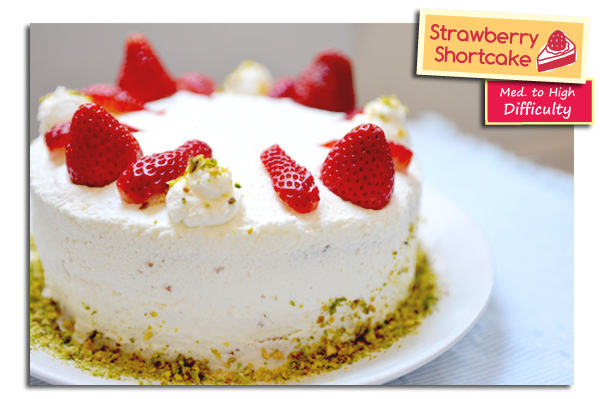 I used chopped pistachios as a garnish on top and sides – makes a very good contrast of colours with the strawberries! Preheat oven to 350°F/180°C. Prepare a 7″ cake pan – line only the bottom with parchment paper. Sift flour and melt butter. Break eggs in a medium sized mixing bowl and whisk with sugar. Set eggs over a water bath (simmering, NOT boiling) until the the eggs reach about body temperature, stirring occasionally – avoid cooking eggs so be careful not to have the heat too high. When flour is all mixed in, add butter + vanilla and FOLD until well mixed (DO NOT over-mix). Pour batter into cake pan and tap the pan the counter to remove any big air bubbles, bake right away in preheated oven for about 30 minutes. Try not to open the oven door during the baking process. The cake is done when a knife is inserted into the centre and comes out clean. Cool cake, remove from pan – slide a paring knife around the pan and cake should come out easily when pan is flipped over (metal knives are not recommended for “non-stick” pans). Beat whipping cream with sugar until firm peaks form. Chill in fridge until ready to use. Cut cooled cake into three even layers. If the cake is shaped like a “dome” on top, cut off the excess to make a flat layer. Brush honey syrup onto the bottom two layers. Place strawberries on the bottom layer of cake and spread on whipped cream evenly, place second layer of cake on top. 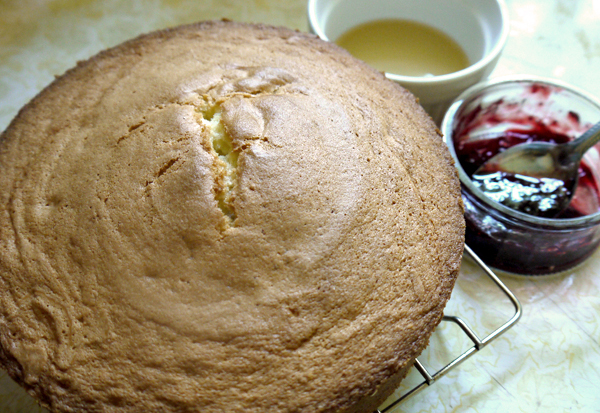 Spread strawberry jam on cake and top with a thin layer of whipped cream. Coat the top and sides with remaining whipped cream. Pipe cream for decoration (if desired – might require more cream). Garnish with strawberries and chopped pistachios. It is not the best-looking cake but it is not bad. 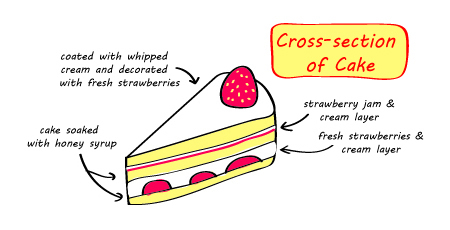 😛 I didn’t take a picture of the cross-section, I thought that it would be nice to see it in an illustration. I didn’t sweeten the whipped cream too much because my mom is a not a big fan of overly sweet desserts. I also cut back on the cream (trying to be a tiny bit healthier). The end result was VERY yummy, the cake had a rich egg flavour and the layers had a very aromatic strawberry flavour – with fresh berries and the jam. Glad mom enjoyed it, she even had two pieces (she usually stops at one).